Skinning up for another lap on Castle Peak with great views with the I-80 corridor below and the Lake Tahoe Basin visible on the left. You can even see the avalanche scar from the “Elevens” on Trimmer Peak in South Lake on the left and the peaks of the Sierra Crest stretching southward. Getting some wide-open sunny turns coming down the southwest aspect of Castle Peak. A view of Castle Summit standing on the corniced ridge that falls down the north side of Castle Peak. Some amazing terrain to explore off this ridge. Climbing up from the south aspect of Castle Peak. The rocks that make up the summit of Castle Peak visible as skinning up from the south aspect. Looking north from Donner Pass a large rock buttress juts out from the ridgeline like a crown resting on the ridge over Truckee. This is the regal Castle Peak, offering a multitude of outdoor recreation options year round, including phenomenal backcountry skiing and snowboarding. Depending on where you go in this zone the distance can vary, about 2.5 miles up to the summit from the south. This tour can be a relatively easy walk in the woods or a full day multiple lap adventure far from the car. Slightly longer approach tour can make this one a touch more challenging. No matter which route you choose, this trip will take you at least two hours to complete. However you can easily make it two plus hours. You can hustle up for a quick lap on the southern slopes, or spend the day exploring the north ridge. 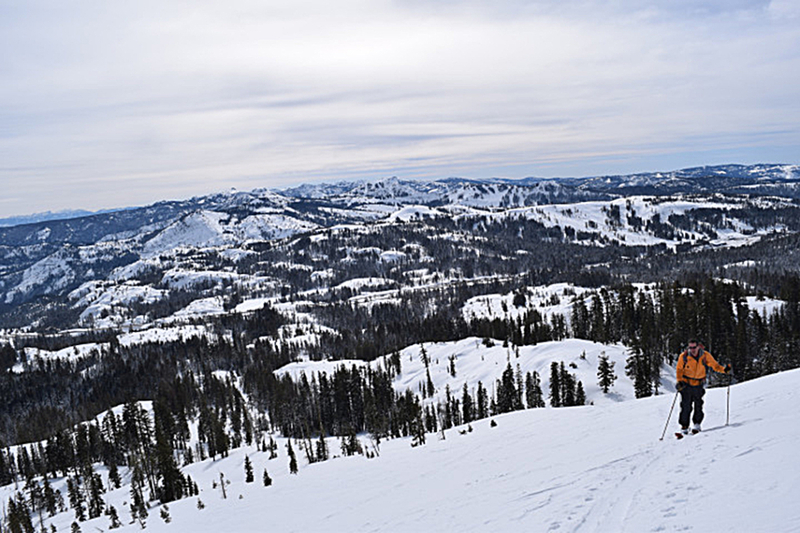 Castle Peak is one of the Donner Pass and Truckee area’s most popular locations of year-round outdoor recreation. The trailhead to Castle Peak grants easy access to backpacking and mountain biking by summer, backcountry skiing and snowboarding by winter, and even the Peter Grubb Hut, an overnight backcountry cabin nestled in the Round Valley below Castle’s smaller west flank. Winter enthusiasts of all types congregate at this trailhead with options for all to enjoy. Accessing a large area of wilderness it is not difficult to leave the crowds behind for some backcountry solitude with a little effort and motivation. The wealth of terrain and ski options around the Castle Peak area is obvious as you glance up from the freeway while driving past. The large south facing apron of snow beneath the main rock buttress offers classic spring skiing on it’s warm sunny slopes. 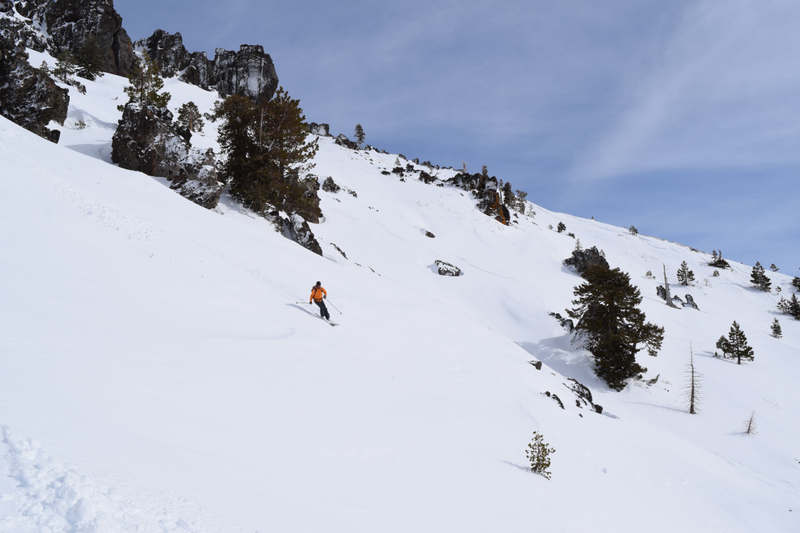 There is a prominent chute down the middle of the rocky outcropping can also ski very well on years with a deeper snowpack. 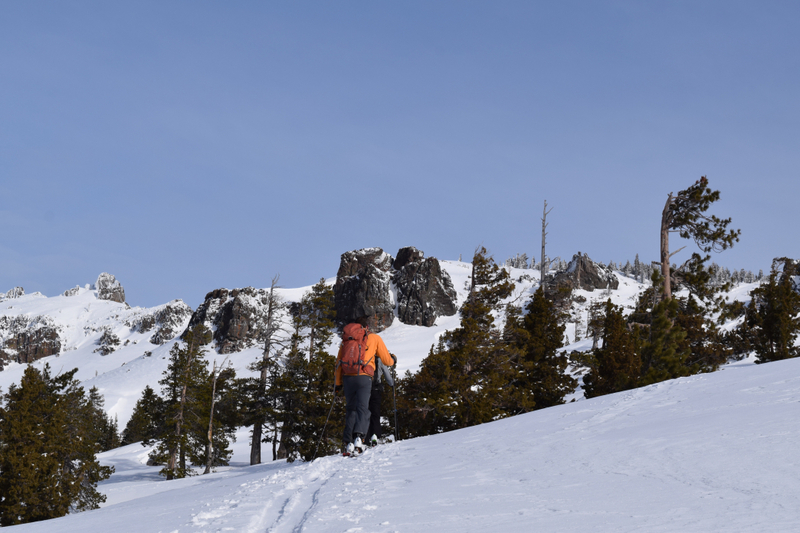 The approach to Castle Peak is not as steep of a climb but can be longer than other Tahoe ski tours with about 1.5-2.0 miles of slight uphill travel before you start the more strenuous final ascent. The sunny south slopes see the most common skier traffic but this is really only a glimpse of what Castle Peak has to offer the more adventurous traveler. 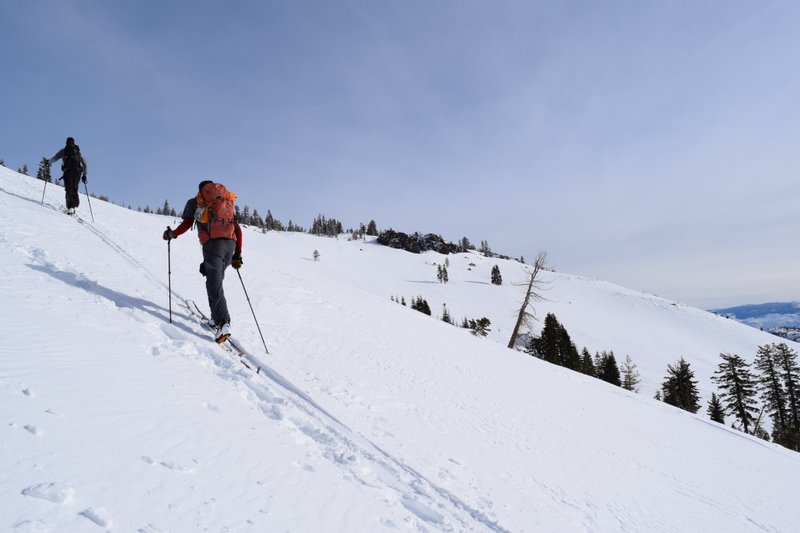 Those who make it to the summit of Castle Peak with enough energy remaining to drop down the north side of the ridge are rewarded with some of the best ski terrain in this area. An impressive corniced ridge with spines that bring images of dramatic Alaskan lines to mind and long winding chutes drop to the valley below; an endless winter playground only limited by your energy and sense of adventure! This area is also home to some great lower angle laps on a perfect bench stretching out beneath the looming rock face that makes up the north side of Castle Peak. To access this northern terrain make your way up around to the south / southeast fields of snow described above, then continue on climbers right of the Castle Peak buttress to the corniced ridge. Additionally, dropping off to the west brings skiers down to Round Valley, home of the Grubb Hut and skiing off of nearby Basin Peak. This trailhead sees regular snow travelers of all disciplines from snowshoes, snowboards, to skis of all varieties; the ease of approach tour makes for fun snow access for many. The south slopes of Castle Peak offer excellent sunny intermediate-friendly skiing, with open glades, expansive views and fun terrain for a wide variety of skiers. 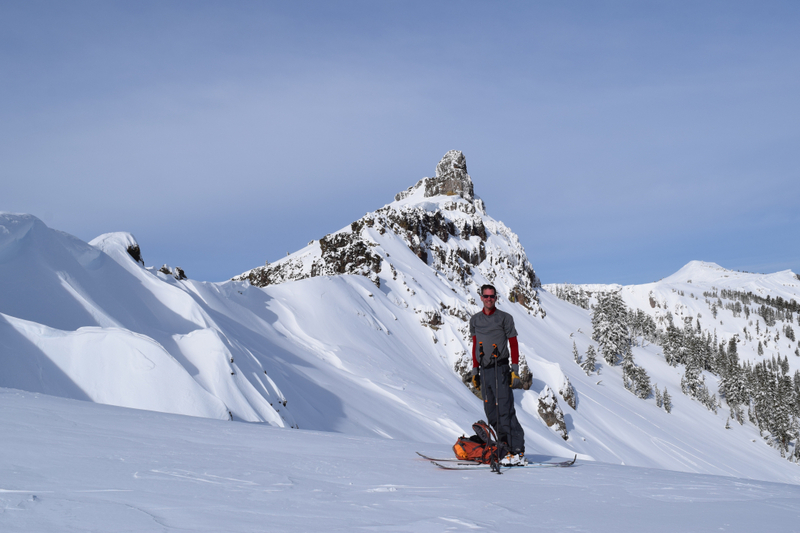 And for the endurance skiers out there, who enjoy a long rewarding grind of a ski, put in some yo-yo laps checking out the incredible lines on the north bowl of Castle Peak. Exercise caution as always when traveling in avalanche terrain; make sure your group is equipped with avalanche shovels, beacons, probes and most importantly the knowledge to avoid avalanches and use your equipment. If Castle Peak is your winter ski objective for the day, a map and some basic route finding skills are required. The parking area for Castle Peak is accessed off the Castle Peak/Boreal Ridge Road, exit 176 off of I-80. As you exit the freeway (coming from the East) you will see the trailhead access road immediately to your right (north side of freeway). Don’t give in to temptation to park in this area, keep going to the left, under the freeway (to the south), left again past the Boreal Inn following signs to the California Snow Park area. 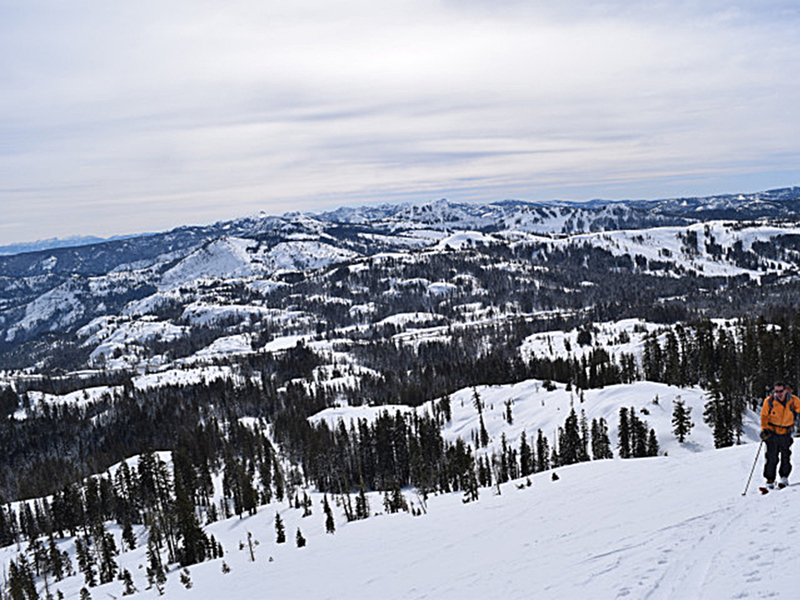 Make sure to buy a California Snow Park pass from Tahoe Mountain Sports. Be aware, this area is regularly patrolled and ticketed, especially on weekends. Walk back towards the off ramp, under the freeway, and back up towards the trailhead to the north of the freeway. From here follow the main trailhead straight, through the road closure gate, there is a fork to the left for motorized travel, non motorized traffic can carry on straight. 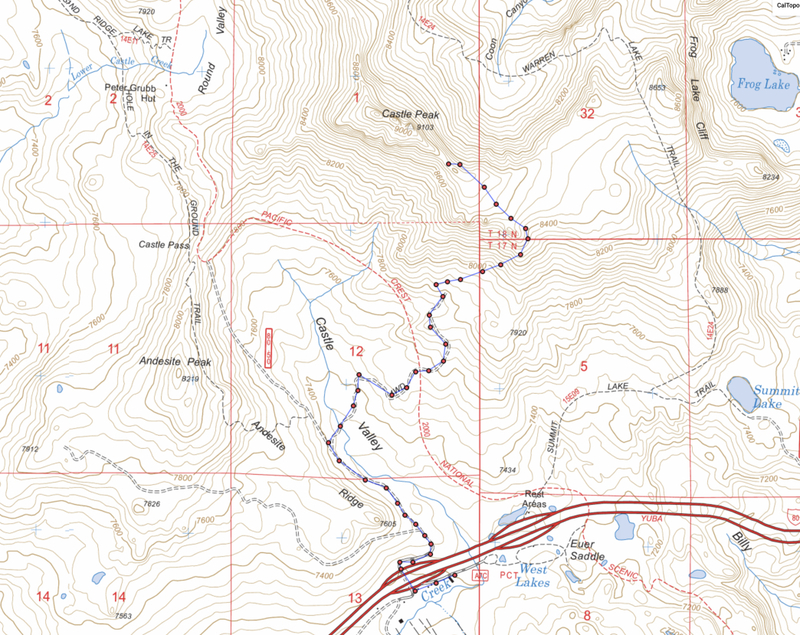 Continue on this well traveled trail, options exist to both continue straight and wrap around towards Castle Peak from the west near Andesite Peak vs. the more direct approach; after less then one mile of touring the skin track will turn right, towards Castle itself and trend more directly towards the southern snow fields.